Is your house crazy over Minions? They are a HUGE hit right now. 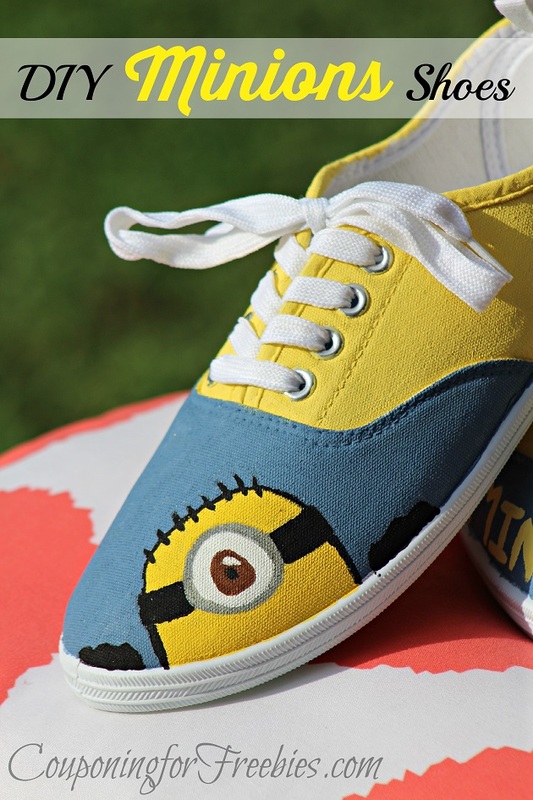 If you are as crazy over Minions as we are, you should check out our crafty DIY Minions Shoes. They are pretty easy to make and you can do it for pretty cheap too! Plus it is just fun to do. You could always do this as a craft project with the kiddos one day. Acrylic or Fabric Paint , used these colors. Yellow, Black, Red, Brown, Chambray Blue, Dark Grey, White and Pink. First thing you want to do is take the laces out of each shoe. Now you want to use the tape on the sole of the shoe. This will keep you from getting on the sole. Use some tissues or newspaper to stuff the toe of the shoe. It will keep it from pushing in while you are painting. Using the pencil or pen draw or trace the Minion on the toe part of one shoe. Then on the other shoe on the side of the toe part draw the half Minion. Be sure to include the clothing and facial features. Now dip a paint brush in the black paint and outline the Minions you just drew. Then using the yellow paint you can fill in the body. Leave the overalls blank. You will fill that part in with the gray paint. You can put details on the overalls in black. Repeat those same steps for the gloves, glasses and hair. Now using black again you can outline the mouth. Then add details like two grey lines on the top and bottom on the mouth adding small white squares for the teeth. Color in the frames of the glasses in grey and use the grey to make a button on the pocket of the overalls. Grab the white paint and fill in the eyes. Then use some brown in the center of the eyes with a small white streak close to the black dot in the eye. Just two steps left! Put a small short line in the mouth with pink. Now add small red dot in the center f the mouth for the tongue. After you are finished painting in your Minions, you can paint the toe of the shoe around them blue. Then paint the back half of the shoe yellow. Using yellow you can write the word Minions on the blue. Let them dry overnight. Before wearing you may want to spray with a weather sealer for shoes.